I’ve been home from Africa for almost 3 weeks now. Anyone with the good fortune to have spent time in Africa will agree with me when I write that it’s harder to come home than it is to go to Africa. I struggled with whether or not I should continue blogging, unsure if there are people out there who still care about what I have to say now that my team successfully ran across an African nation. I thought about continuing to write in the context of the number of people who come in and out of my life (work, personal, sport) and ask me “how was your trip” and want a 3-word answer. How could I possibly answer in 3 words? But I know that this is what they want so I respond “It was amazing” and they reply “Great!” and go about their day. Then there are the people who only want to know if I saw any spiders or monkeys, if the food was weird and if the toilets were gross. I also thought about writing in context of my great love for my team, for running, for the NSGA and for The Gambia. At the end of the day, the words are still coming out of me so I’ll continue to write. Now back to returning home and reintegrating into my life in Nova Scotia. It’s accepted that some travelers will experience culture shock when traveling for extended periods of time in countries that differ greatly from their own. This was my 3rd summer spent on the continent of Africa and I don’t personally experience what you would label “culture shock” in West Africa. Gambian culture is one that I know and love. This summer, while running and spending 24/7 with 3 Gambians, I had the incredible fortune to get know and love their culture even more intimately. On August 3, I arrived home in Nova Scotia after pretty much a transcendent experience with Gambians who I call family. The reintegration is complicated. The thing is, I’ve just spent my summer raising money to help prevent HIV and malaria in West Africa. In 2010, malaria killed more than 1000 kids under age 5 in The Gambia. The 2010 under-5 mortality rate for Gambian children is 106. The under-5 mortality rate is the probability of dying by age 5 per 1000 live births. This means that for every 1000 kids, 106 will die before their 5th birthday. In Canada, the under-5 mortality rate is 6. In The Gambia, 16% of kids under 5 suffer from moderate to severe malnutrition. Only 61% of kids in The Gambia are enrolled in grade one because their parents have to pay school fees. All stats are from Unicef and WHO. I returned to Canada to a work place concerned with and focused on how 1 in 3 Nova Scotian youth age 2 to 17 are overweight or obese. Sure obesity is a public health problem. Our Minister of Health and Wellness’s most recent press release stated that poor diet and inactivity are putting many young people at risk for a lifetime of chronic disease and other health issues. I don’t disagree. But when you think about where and how I’ve spent my summer, maybe you can understand why I’m having a hard time reconciling… what is a problem. I have to live and work in Nova Scotia. I have to work on this. I expect progress to be slow. Last time I got home from Africa, I quit my job. I’ve promised my manager that I won’t do that this time. I’m not really into running right now. I know that running would help burn off professional angst but I just can’t do it. My desire not to run is about several things. The primary force making me sit on my patio instead of running is that it doesn’t feel special. My heart is just not in it. My last training cycle, all 7 months of it, was focused on preparing to run across The Gambia, which would be the crowning achievement of my running career. It was. But now that we’ve run into the Atlantic Ocean in Banjul, running doesn’t feel special because it’s not for The Gambia anymore. Second, the thought of running makes me feel tired and this is fair. I’ve just spent 7 months of my life training for The Gambia and one month running in The Gambia. For these 8 months, my life pretty much revolved around 5 or 6 running days per week. I have been so committed to running in The Gambia that I don’t want to be committed anymore. And because a new race commitment won’t be as special, it makes me feel more tired. Finally, I miss Pa Modou, Kebba and Spider so much with each running step that I almost don’t want to take any steps because then I’ll miss them more. There’s nothing I can do about missing them. It just is. I can’t make it better because I know that we realistically won’t see each other in the next one or two years. But I can stop running and miss them less. My coach Cliff wants me to take a page out of the Kenyan and Ethiopian training manuals and take a full month off. I always listen to Cliff so you’ll find me on my patio this month. 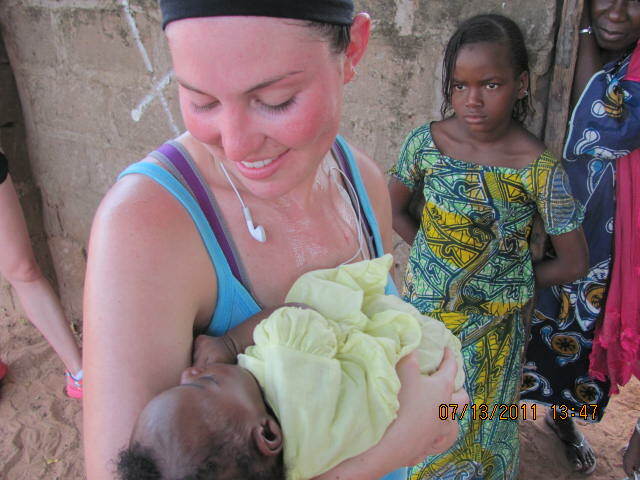 While I’m sitting on my patio, I’ll be thinking about our Love4Gambia run. People keep asking me if my accomplishment has sunk in. Or if I’ve processed the entire experience: what I’ve been through, what I’ve achieved. I don’t really have an answer for these people. I don’t know how I am supposed to feel right now or what it will feel like when I’ve “processed” the fact that I’ve run across an entire country, that I’ve gained 3 brothers and a sister, that I’ve raised $34,000. Nothing in my life has prepared me with how to process this. All I know is how I feel now. How I felt when I saw the Arch to the city of Banjul with my team. Thank God, I can still close my eyes and feel what I felt when Spider yelled, “I am seeing the Arch!” and it appeared before me and my team and we knew that we had made it together. I don’t ever want that feeling to disappear. I also don’t want to lose the way I feel when I look at the Atlantic Ocean. The way that Pa Modou told me to feel; like the Ocean connects us as much as it separates us. I’ll run again when I feel ready. My fatigue and loneliness will lessen. In The Gambia, I thought a lot about my Canadian support network. They were running 25 minutes a day to support me. They were running in spirit with me. On certain days on the long road to Banjul, I felt like I could just turn around and see them behind me. I know that when I am ready to run again, Spider, Kebba and Pa Modou will be right behind me. This entry was posted in Volunteering in Africa and tagged Banjul, culture shock, fatigue, obesity, reintegration, reverse culture shock, running, The Gambia, training. Bookmark the permalink. None of us can begin to understand what you are going through or how you feel right now. But by keeping blogging, and telling your stories to your friends and family, you can keep the experience and memories alive! Keep on blogging.! The people that want to read your posts will still read them. We, your family, care very much how you feel and will never get tired of hearing about your experiences. So pleased to read this. I’ve been wondering what’s been happening inside your head. I’ll be reading and following your adventures as long as you’re writing and sharing. I think you can inspire and guide us all in our individual pursuits to do good work in this world no matter what they may be. That’s what has me so fascinated with what you have accomplished!!! When you write about running I feel as though I am there running with you!! And your honesty is refreshing. It wasn’t always easy though you made it look easy. I sometimes had to remind myself it’s not easy. I would have been weeping in a corner on day two!!!!! Hi Glenda, thanks for reading with such pleasure and taking the time to write to me. And thank you for your ongoing support and kinds words. Erin, I will always read your blog. It feels like I was there with you although I would have been with Glenda in the corner weeping. The Gambia has left a huge impression on you (and Ashley) and is not something that will go away quickly or easily if ever. I think you have left just as big of an impression on Pa Modu, Kebba and Spider as they did on you. Share your experience with everyone who will listen and maybe even some who should hear how difficult it is for children in The Gambia. Educate whenever and wherever you can. thanks for you unwavering support, Dawn, Joanne and Laura. I have the best family! I’m still reading too. I’ve always found it pretty difficult re-integrating and am always interested to hear how others find it. I’m sure you will be back to running with a passion, but for now, a break sounds like a great idea. Congrats again on such a successful fundraising effort!